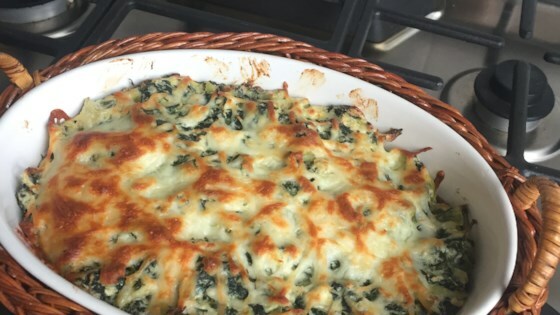 "I've always enjoyed hot spinach artichoke dip, but it always struck me as a little oily. I decided to try a mayo-less version, and then raised the stakes even higher by excluding the sour cream as well. To counter this, a bit more cheese was added, and the results were amazing. A rich, creamy, cheesy, not greasy dip." You can use one larger baking dish instead of the two ramekins to bake the dip.